Whew - what a scorcher! The fact that it was the hottest day of the year - so far - did not deter a dozen riders from attending the Ledbury Ride on 31 July. 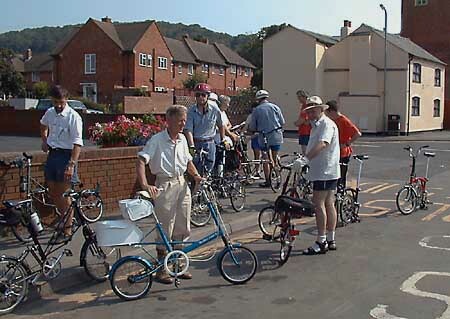 Although this Moulton Bicycle Club event was designated as 'Folder Friendly' only 2 non-Moultons (Bromptons) were present, but several other folder owners were present, suing their Moultons on this occasion. Amongst the Moultons, there was a good selection of models present, with perhaps rather more 14inch-wheeled bikes and AMs than usual, and less APBs.Photograph: Preparing for the start outside the Fire Station. Organiser John Sewell had as usual devised a delightful route meandering through beautiful Herefordshire countryside, and at 20 miles the distance and pace was ideal for such a sweltering day. The refreshment stops were particularly welcome. 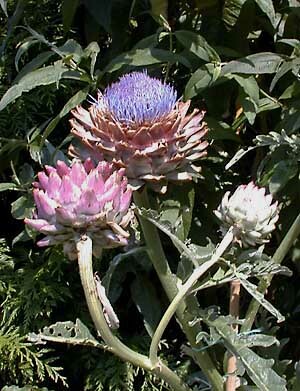 Photograph: During the morning stop, those sitting in the garden were rather concerned by this plant, which we thought looked alarmingly like an Audrey II (as in Little Shop of Horrors). 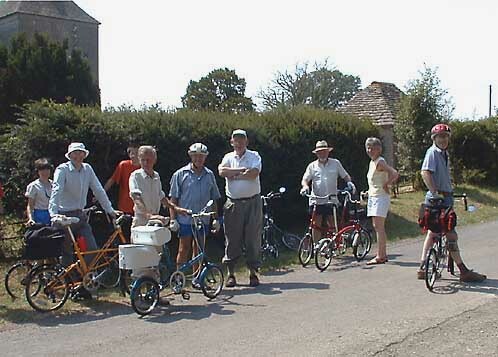 Our group shot shows some of the riders preparing to restart after a visit to a very old church which featured, amongst other things, some notable wall pictures; it also provided a wonderfully cool and shady sanctuary on such a hot day. Many thanks to John Sewell for organising such an enjoyable day.